There are two parts to this process of intuition. The first part is when an event is happening, and somewhere in your gut, somewhere in your inner core you know the outcome. The second part is translating that knowing into what I would like to call “knowledge”. Part 1) knowing which is unmanifested, where you somehow have a feeling in your stomach somewhere that you know the answer. Part 2), knowledge, which is bringing that knowing to the surface, into articulation. Today’s meditation session is dedicated to this ability, this knowing, what we call “intuition”. Have you ever felt that you could connect to your intuition? The first form is instinct. Instinct is when this knowing is there and without translating it into knowledge, you act. In a situation when it’s a question of life or death, or survival, you use your instinct. Without reason, thinking or processing. You know and act. We would generally rarely use our instinct in our day to day life. The second form of intelligence is intellect, or reasoning, which is on the surface. It’s not the knowing, but the knowledge where you collect a lot of information about a situation, and based on the information that is gathered we can make logical decisions. It always remains on the surface and requires prior data or knowledge. You would use this in your daily life, and it has an important significance in how we live our lives. The third form is intuition. Intuition is when the knowing is also coming to the surface and becoming knowledge, without involving reason or a process which you can explain logically. This ability of intuition is present in all of us. All we need to do is tune into it. It doesn’t have a practical utility, ie. you don’t necessarily need it, but in many situations in our life we come across junctions where we have to make a decision and sometimes that decision can’t happen rationally or logically. We have to rely on our gut feeling or intuition, or an inner sign that tells us to go for one option or another. Intuition is something we can enhance with meditation, as we can tune into ourselves deeper using meditation. The fourth form is absolute knowledge, which is beyond the scope of this session. It’s a form of intelligence arising out of pure consciousness or pure intelligence, where there is no relative knowledge. It’s absolute knowledge and knowing. In this session we will focus on the third form of human intelligence, our intuition. So how do we tune into our intuition as part of meditation? Firstly we will tune into our heart centre to build trust in oneself. We will keep our awareness to the centre of our heart, bringing an attitude of trust and settling our awareness there and sitting in silence, in tune with our own selves. Secondly we’ll go down to what in yogic traditions is known as the Swadhisthana chakra, or in simple words, the area that is two inches below the navel – where you say you have a “gut feeling”. This is where the knowing happens, which we call intuition. We will tune into this centre and bring our awareness here. We’ll see what sensations are there and allow ourselves to settle in to these feelings. In order to translate this knowing into knowledge, you need something more – another dimension or ability to translate the knowing into reality. This is present in the seat of the Agya chakra. In yogic tradition this is the area between the eyebrows, and is known as the knowledge centre. We’ll bring our awareness to this region and stay here for a few minutes, feeling what sensations are there and settling for a few minutes. Then we will take our awareness to the top of our head and visualise as if there is an opening in our heads, and there is a flow of energy between your head and the universe outside. Allow yourself to openly visualise energy flowing in and out, an exchange of energy between your head and the outside. After these four steps, we will stop and sit in silence, in awareness of the moment. Close your eyes, and take a deep breath – inhaling and exhaling from the nose. Allow yourself to arrive in this moment. Allow your body to find a comfortable posture. Keep your back straight, shoulders down, neck straight and there’s no tension on your face or any other part of your body. Take another deep breath in from the nose and out from the nose. As your body is settling, your mind is settling, take your awareness to your heart centre, to your chest. With every breath, bring your awareness more and more to your heart’s centre, and tune in to a sense of trust in yourself. Allow yourself to trust yourself. A pure awareness in the heart region. Go deep into the silence, into the peace that is there in your heart. With every breath, let go of everything, and just tune yourself into your heart region, bringing your awareness here and feeling the silence and peace that is arising out of your heart region. With every breath, let go more. Peace and silence in your heart region. Try to feel it with every breath that you take. Your body is settling, your mind is settling. Your awareness is at the heart region. A sense of trust in yourself. Now very gently move your awareness down to the Swadhisthana chakra, to the area two inches below your navel. Feel the sensations in this region. With every breath, go deeper into the sensations, feelings and awareness in this area below your navel. Allow your awareness to settle there, your body still, your mind calm, and your awareness settling in this region. Allow your breath to reach this region, as you breathe in and breathe out. Now gently move your awareness to the region between your eyebrows. Keep your face relaxed, your body relaxed, and your awareness gently settling here, on your Agya chakra, the centre of knowledge. Feel the sensations there and allow your awareness to focus more with every breath. Keep on breathing as normally as you always do, and your awareness at the middle of your eyebrows. If there are any sensations, any pulsations, let them happen and let them go. Just remain aware. Now move your awareness to the top of your head. Visualise as if there is no boundary between your head and the outside. Observe and feel any sensations here at the top of your head, and allow any sensations here to grow. Allow the energy from the top to flow into your head and from your head, back to the outside. Keep your awareness here at the top of your head, and for a minute of so just settle here with this awareness. Your body is absolutely still. Your mind is calm. Now leave this process and simply remain silent and aware. With every breath become more silent. With every breath remain more aware. Stay here. Breath flowing in and out. Let go of everything. Don’t touch anything. Remain in the silence, this awareness for a couple more minutes. Gently bring your awareness back to your body. Breathe in and out, bringing your awareness back to the body, to the mind, to your breath. Keep breathing slowly and gently. When you’re ready, you may open your eyes. Give yourself this moment to reflect upon what you went through, how it felt and if it meant anything to you. Enjoy the lasting remnants of this session throughout your day, and remember to trust your instinct. 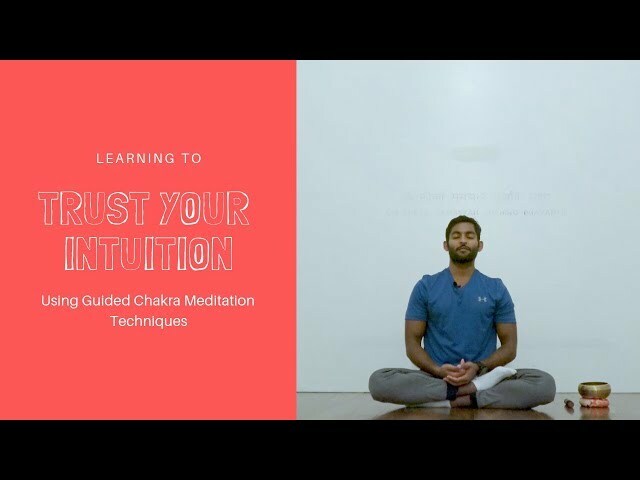 Learning to Trust Your Intuition Using Guided Chakra Meditation Techniques is the full video of a guided meditation session with Dhyanse in Basel, Switzerland held on 10th December 2018. In this session, we use a meditation technique to help us tune into and learn to trust our intuition more. By bringing awareness to several of the chakras, as well as a short visualisation technique, we are able to help fine-tune our intuition, or gut-feeling. There are two parts to this process of intuition. The first part is when an event is happening, and somewhere in your gut, somewhere in your inner core you know the outcome. The second part is translating that knowing into what I like to call “knowledge”. The first form is instinct. Instinct is when this knowing is there and without translating it into knowledge, you act. In a situation when it’s a question of life or death, or survival, you use your instinct. Without reason, thinking or processing. We would rarely use our instinct in our day to day life. The second form of intelligence is intellect, or reasoning, which is on the surface. It’s not the knowing, but the knowledge where you collect a lot of information about a situation, and based on the information that is gathered we make logical decisions. It always remains on the surface and requires prior data or knowledge. You would use this in your daily life, and it has an important significance in how we live our lives. In this session we will focus on the third form of human intelligence, our intuition. So how do we tune into our intuition as part of meditation? Firstly we will tune into our heart centre to build trust in oneself. Secondly we’ll go down to what in yogic traditions is known as the Swadhisthana chakra, or simply, the area that is two inches below the navel - where you say you have a “gut feeling”. This is where the knowing happens, which we call intuition. In order to translate this knowing into knowledge, we need something more - another dimension or ability to translate the knowing into reality. This is present in the seat of the Agya chakra. In yogic tradition this is the area between the eyebrows, and is known as the knowledge centre. Then we will take our awareness to the top of our head and visualise as if there is an opening in our heads, and there is a flow of energy between our head and the universe outside. I hope that this session brings you further trust in your intuition!